To be crazy is far easier for some. Those whose hands are too experienced and too nimble are hard put to feel free and go wild and let themselves go. 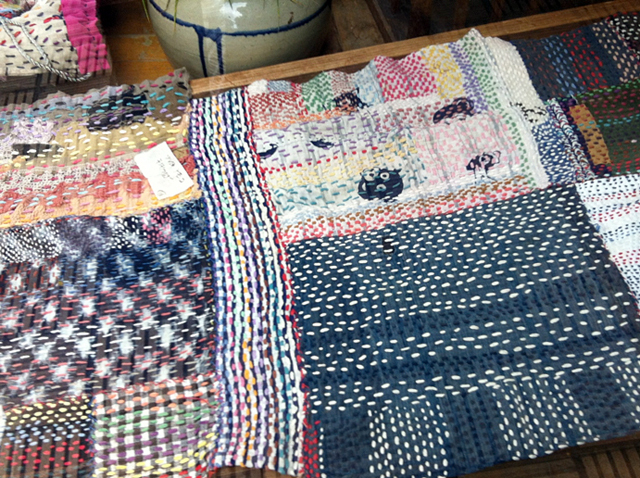 For many entrants to our recent Crazy Sashiko Contest that was the case. In all modesty, some admitted that their sewing skills were too advanced to try to do something “crazy”. It had to be perfect or they didn’t want to try. Some reckless souls deigned to try their hand. 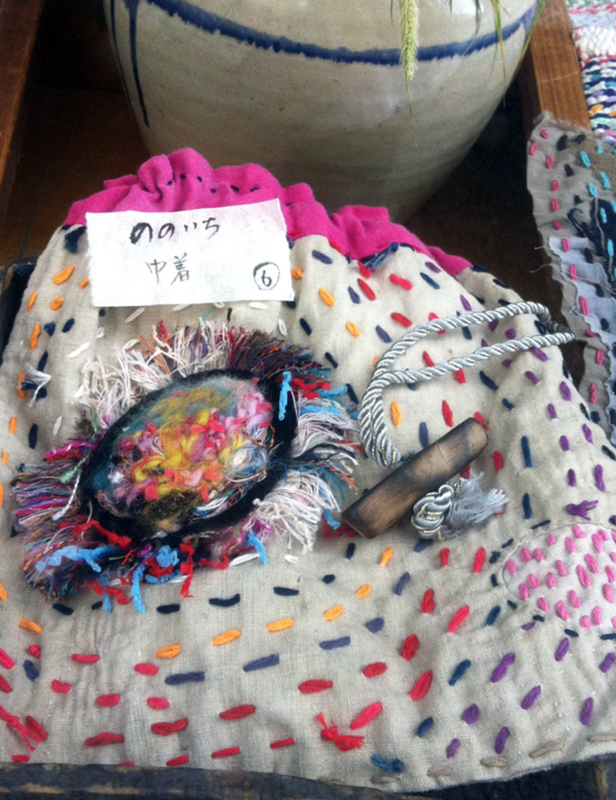 Akiko Ike of Niigata Ginka Gallery in Niigata City, is a highly experienced seamstress. Her fingers very agile, but she prefers the rough and random offshoot of sashiko that she calls Chiku-Chiku, the onomatopoeic word for the sound of a needle passing through cloth. 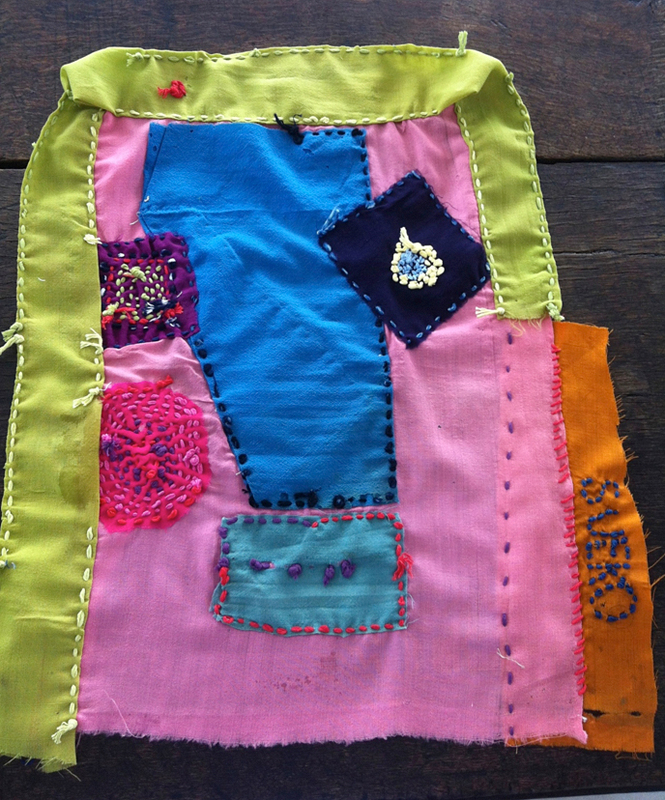 By using pieces of old cloth to sew her Chiku Chiku, she applies squares or circles of old cloth to cover up holes while embellishing the decoration. She comes to Blue & White 2 or 3 times a year and gives classes on this meditative and therapeutic stitchery that brings rescued cloth back to life again. Her Chiku Chiku koinobori carp banner was the heads on number one choice of all the visitors to Blue & White who voted for three top entries. Her thick red stitches bring the worn banner back to life and give it volume and thickness and splash. The relentless stitches that Ike san sews are a monument to her dedication to Chiku Chiku, a magic revitalizer to both cloth and seamstress. She has had exhibits all over Japan, and last year in Nimes, France. Of course Akiko Ike was the unanimous winner of the contest was Akiko Ike with her Chiku Chiku Koinobori sewn with straight stitches of thick red thread on an old Boys’ Day Banner. Hayasawa Sayoko, the styley and irrepressible manager of Blue & White is handy with a needle and spends a goodly amount of her time in the shop sewing special bags for Otafuku masks and chop stick covers for the shop and also makes her own skirts out of old shibori and kimono and adapts clothes that make her a stunning fashion plate as she welcomes all who visit Blue & White. 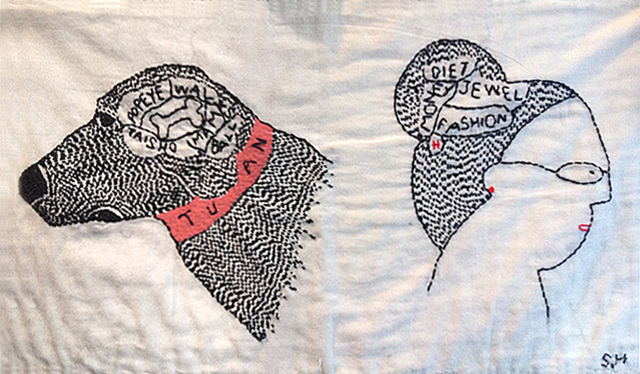 Her first entry into a Zokin (dust rag) contest that we held perhaps 8 or 9 years ago, was a never-to-be-forgotten sashiko portrait of her and her dog Tuan and what they think about. This year she was more restrained, and though beautiful rather than crazy, she won second prize with her BLUE EARTH. All who visited Blue & White were asked to judge their number 1, 2 and 3 favorites. Other entries were also notable and worth showing here. Hopefully they will encourage others to try their hand at the Crazy Sashiko contest Blue & White will hold the contest at the end of each summer. Kumi Sasaki is both highly skilled with her hands, and her head is filled with flights of imagination that dexterity sometimes brings. She deservedly won third prize in the completion. 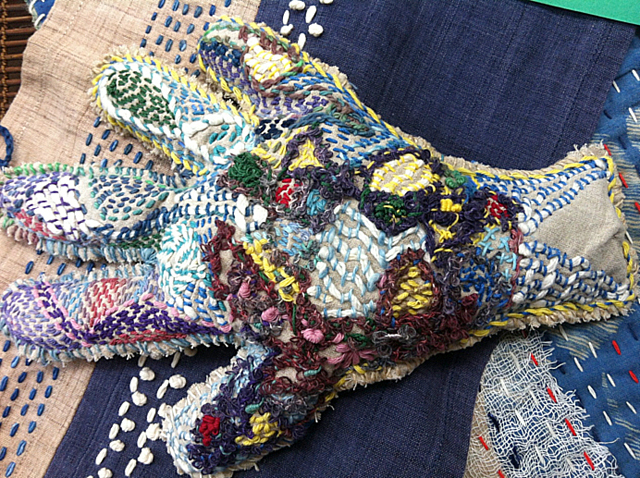 Her entry is a needlework sculpture of the form of her own hand cut out of cloth and stitched with random and skillful stitch work forms and colors. A joy to behold, it makes you laugh and gaze in wonder. And it is stuffed with sweet smelling mint leaves and serves as a potpourri. Reiko Okunushi, whose magic fingers have been creating superb Otafuku quilts, quilted bags, toys and baby blankets for Blue & White for over 30 years, also has a touch of crazy in her. Or, if not crazy, playful and whimsical are qualities that define all her work. Joy and a love of sewing shine out from every unique piece she creates. Her work is distinctive and filled with a perfect combination of deftness of hand and fullness of heart. Not only cat lovers were taken with these naïf cat portraits that take sashiko beyond the pure graphic and into pictorial realm. The helter skelter stitchery on this apron is the work of NoNo Ichi san who hides her considerable sewing ability behind these rough rides of thread on cloth, creating marvels that harken back to the antique indigo BORO that are so popular today. Chiku Chiku Junior by Tomoko Ike, Akiko san’s talented and imaginative daughter and manager of their iconic gallery Niigata Ginka in Niigata. These pants will surely stand out in any fashion parade while being durable enough to wash floors in when you get home. 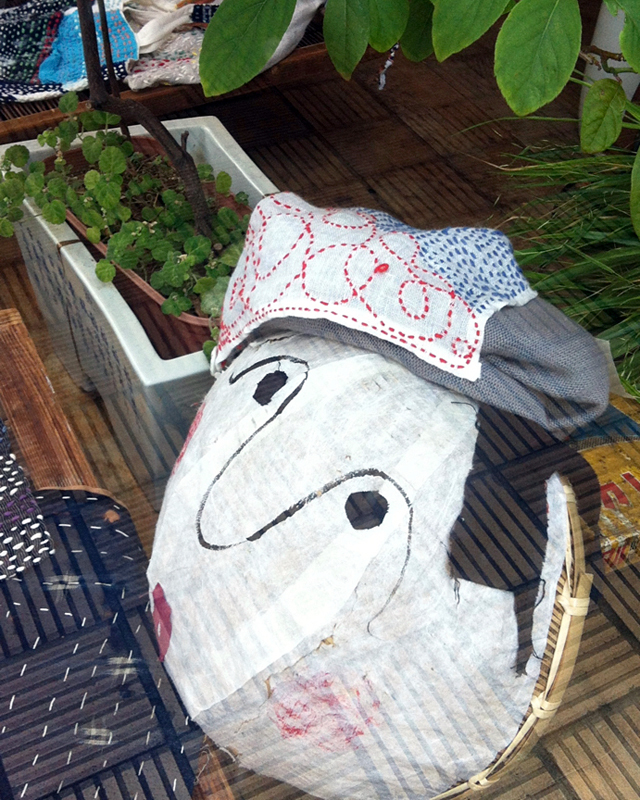 Colorful T shirt by Akiko Morimoto shows just some of her energy and spontaneity. She even left the needle and thread in the T shirt for further embellishment. Uzumaki bag by our own NoNo Ichi San who makes miraculous bags, each one different, each one jaw-dropping. Wild and wonderful seem to come naturally to her. Lowly and loveable Mermaid! by Hana, 6 year old grand daughter of our dedicated and forever young Megumi Kajikawa. Wandering sashiko hat by Asako Sangai, our own irreplaceable artist and Blue & White graphics designer of original cards, calendars, catalogues and announcements. 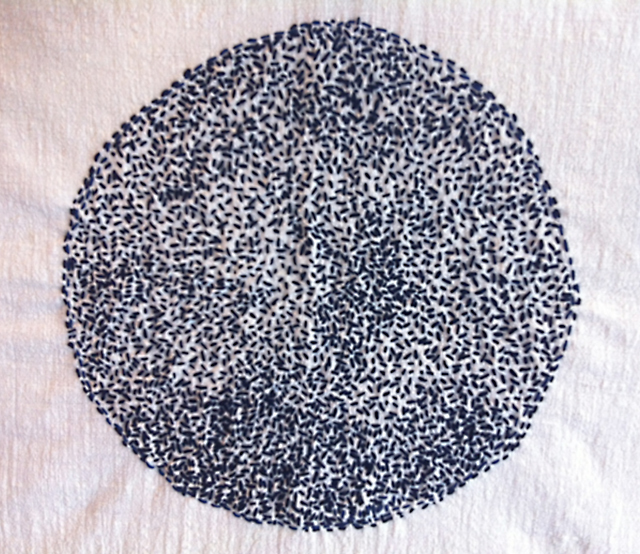 Meandering sashiko, my own unsteady sashiko on left over pieces of wool muslin collected by Sueko Nakazawa, my husband’s beloved Aunt who taught me about the marvels of Japan and the importance of preserving its textiles and culture. She and her elder sister Toshiko, my husband’s irresistible Mother, taught me Mottainai and the spirit of Japan. They live on in their stitches and in their carefully collected textiles. I LOVE your blog but HATE the fact that you don’t respond to enguiries. Thanks again for your precious time. Kind regards from the Netherlands. Always a delight to receive the Blue and White posts. 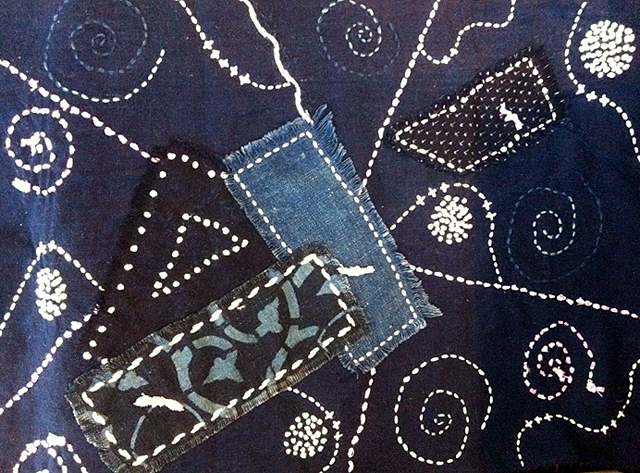 My sashiko pieces are a creation in progress and I look forward to my next Tokyo sojourn to visit Blue and White. 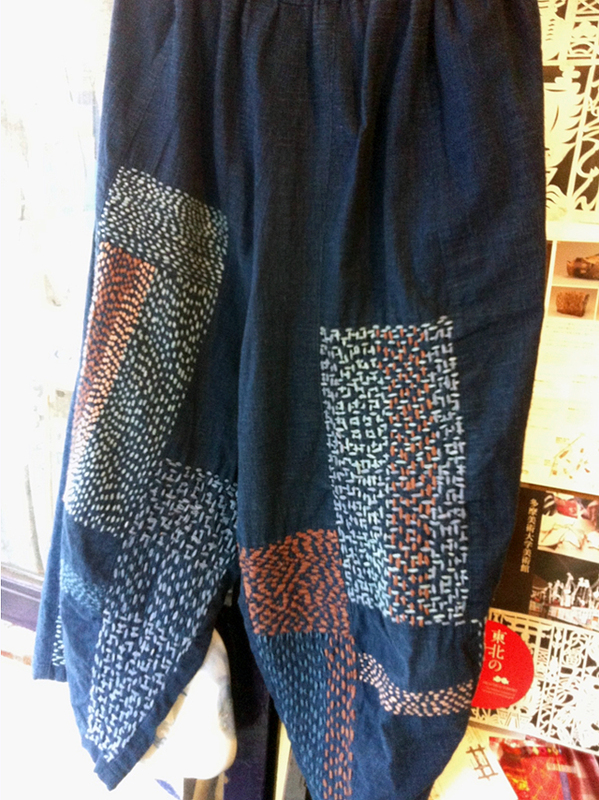 Wonderful pieces of crazy sashiko, very inspiring. I am also wondering about the 2015 calendar. Can I have it sent to Sweden??? We’d be happy to send it to Sweden. Have a look at the newest post. About GENKI ! and our 2015 Calendar. Just tell us where and how to send it along with your credit card information. Thank you for writing. Sorry so slow to reply ! I will always remember Blue and White as the place where I fell in love with sashiko, and posts like this are thrilling! Thank you Amy.